In an age of globalization, American leaders ought to be learning from and working with Europeans—not alienating them. The president’s first official trip to Europe was a scorching fiasco. His boorish behavior—elbowing aside Dusko Markovic, the prime minister of Montenegro, in order to get to the front of a group of NATO leaders—gave new life to the term “ugly American.” But Trump’s words were even more damning than his deeds. The new president’s behind-closed-doors bombast on issues ranging from security agreements to trade to climate change were so frequently combative that it soured rather than mended frayed relations. 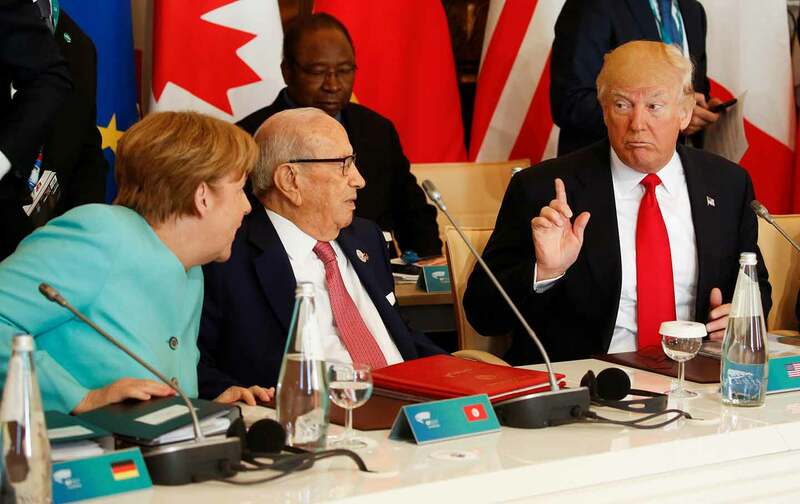 And his hectoring speech at the NATO headquarters in Brussels was so undiplomatic that German Chancellor Angela Merkel felt compelled to suggest afterwards that the United States could no longer be seen as a reliable ally. We have a MASSIVE trade deficit with Germany, plus they pay FAR LESS than they should on NATO & military. Very bad for U.S. This will change. It is true that the United States had a trade deficit of $67.8 billion with Germany last year. But it is also true that Germany is a huge purchaser of US products and services, buying $80.4 billion in 2016. Germans buy more US goods and services than any other mainland European country; and Germany also serves as an economic engine for the whole of Europe. For Americans who are serious about domestic and international economic developments, however, debates with the Germans about trade and fiscal policy are not the primary concerns. There are great debates going on in countries that take economic planning seriously, including Germany, about the future. What Trump is doing is putting the United States not just on the wrong side of those debates—but on the fringe of them. Germany is not just another ally. It is a major economic power that has, to a dramatically greater extent than the United States, recognized the outlines of the next global economy. It has at least attempted to adjust to the demands posed by rapid globalization, the digital revolution and automation. When Robert W. McChesney and I wrote about the challenges facing nation states in the 21st century, in our 2016 book People Get Ready: The Fight Against a Jobless Economy and a Citizenless Democracy, we spent a great deal of time looking at how countries around the world were adjusting to the radical economic changes that are taking place—and that will take place at an accelerating rate in the near future. No country got perfect marks. But German thinkers, business leaders, and government officials have clearly recognized the challenges that are coming, in ways that their American counterparts have not. The United States has been falling behind, rapidly, not merely because of unfair trade policies but because its leaders have for the most part failed to recognize the need for smart industrial policies and for an urgent rethinking of the demands that the “gig economy” will place on social-welfare programs and society in general. Germany does not have all the answers. But it is one of the key countries that this administration needs to be learning from—and working with—if the United States is going to address the stark realities of a future that is arriving more quickly, and more disruptively, than most economic planners (in the US and globally) imagined even a few short years ago. Trump may or may not be choosing isolation. But he is definitely choosing ignorance. Countries such as Germany have put a good deal of energy into figuring out how to make the next economy work for them, and for the world. They have done this by investing in new industries, by planning to preserve communities that face the threat of deindustrialization and dislocation due to automation, by rethinking work life and work weeks, by remaking their education and training programs, by experimenting with guaranteed incomes and by recognizing the danger of austerity initiatives that undermine society. The United States needs to catch up. And to do that, the United States must have good relations with the countries that have recognized the changes that are coming their way and begun to adjust. Donald Trump may not know it, but the simple reality is that we cannot afford to lose the knowledge and the insights that come from a strong relationship with Germany.